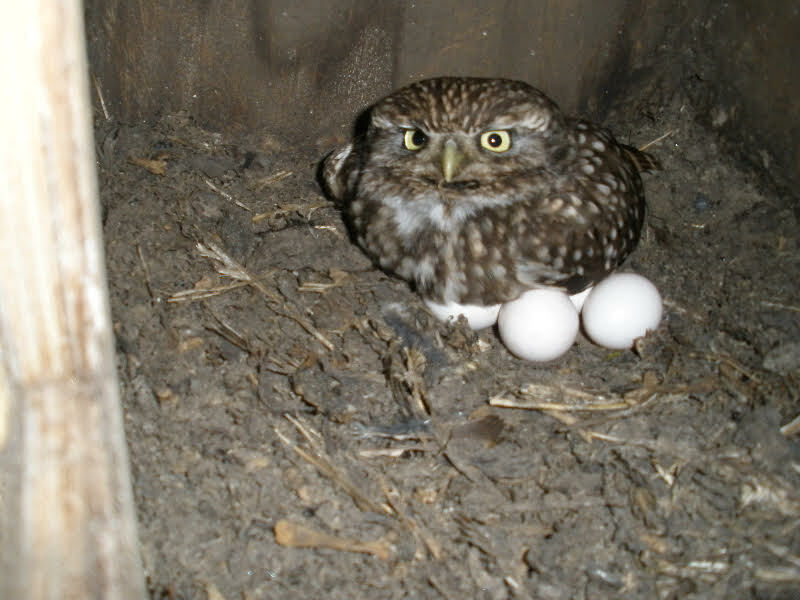 Little Owls readily take to nest boxes, particularly in old farm buildings. The box design I use is important as it mimics a hole in a tree. My father designed the box back in 1998. A very big clutch of Little Owl eggs. Taken by Bob Sheppard/Alan Ball. In the past nineteen years our Little Owls have increased as more boxes have been installed and we now have 80 pairs breeding. 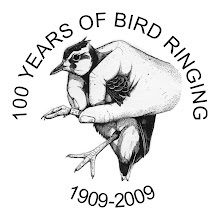 We monitor the adults for the Retrapping Adults for Survival scheme as well as submitting records to the Nest Record Scheme. In late April/early May, my colleague Alan Ball (who works with me to monitor all the boxes every year) and I catch all the adult females at the boxes (males are rarely caught in the boxes). The females are very site faithful and so we often retrap the same birds for several consecutive years. We then make a follow up visit to ring the chicks. Little Owl struggling to sit on all those eggs. Taken by Bob Sheppard/Alan Ball. 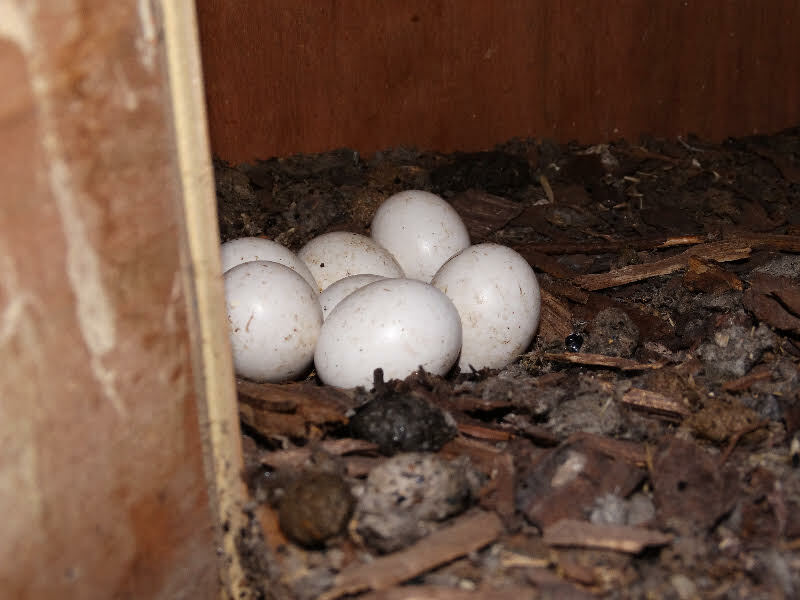 This year we have found eggs during the first week of April which is very early indeed for Lincolnshire. Clutches of four are the average but we do find quite a few fives, including three already this season. Six egg clutches are not unknown and we once had a seven! The egg-laying season is unusually staggered this year; in several boxes we have heavy females yet to lay. Recoveries are rare (see online reports) but we meet lots of old friends as we open the boxes. Ed - For more information on the details of Little Owl biology, see our BirdFacts page. Lincolnshire holds the record for the highest number of nest records of Little Owl (77) in 2016, with Norfolk following quite a way behind (14). For the 2015 results of any species click here.